We have been serving sail making industry since 2006 and obtained a great success by understanding and meeting the demands from worldwide sail makers and repairs. Today we have ability to bring you the practical sails seaming solutions to meet your needs today as well as tomorrow. Our sail maker sewing machines covered all sewing production of sails from straight stitch to zigzag, from light - medium weight windsurfing sails and spinnaker to extra heavy sails, from short arm zigzag to long arm and high arm zigzag, from small one man sail loft to large manufacturing environment. 9518 medium weight zigzag sewing machine for surf sails and spinnaker: It is one of the finest general-purpose machines for sail makers and repairs, standard equipped with 4 Cams for straight stitch, 1-step (2-point), 2-step (3-point) and 3-step (4-point) zigzag. This sail sewing machine can be set up to sew anything from 1/2-ounce spinnaker nylon with #30 thread to 14 layers of 9-ounce Dacron cloth with #138 thread! Designed for manufacturing windsurfing sails and spinnaker, especially the one-man loft specializing in cruising sails for boat under 35'. 9266 extra heavy duty straight stitch and zig-zag lockstitch sewing machine for sewing webbing to reinforce: Extra heavy duty straight stitch and zig-zag industrial sail making sewing machine is designed for sewing very thick sails, attaching reinforcement webbing into edges and sail corner reinforcement patches, with thick thread V277 and needle 250. This zigzag machine also can be used as heavy duty rope-end bar tacker, to make sewn eyes termination or binding rope thimbles for boat rope, yachting rope, sailing rope and marine cordage. Many sail makers are still using Durkopp Adler 166 or Durkopp Adler 266-1, 9266 is the next choice. 9366-12 Extra heavy duty triple 3-step zigzag sail making sewing machine: It is affordable heavy duty zig-zag sail sewing machine for most sail makers and repairs. Today is there the need for 12mm( zigzag width) 3 step zigzag for seaming bigger sails, it is almost necessary to have an extra heavy duty zigzag sail making machine, which can cover straight stitch, 1-step (2-point), 2-step (3-point) and 3-step (4-point) zigzag. 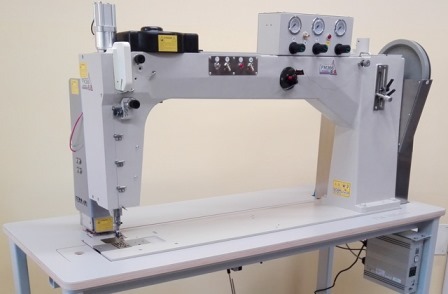 This machine is capable of powering its needle through 20mm of Dacron, Kevlar, Webbing, Canvas and leather; Extremely strong needle penetration force, can easily sew sturdy webbing reinforcement and extra heavy sail corner patches. The basic mechanics (Shuttle hook, adjustments and timing) is the same with Adler 366 and Adler 266, therefore it is easier for the sail lofts already worked with these sail making machines. 9518-30 Long arm zigzag spinnakers sewing machine Long arm medium weight zigzag sail maker sewing machine for light to medium weight spinnakers, windsurf sail and up to heavy sails, using needles size 90 - 130 with thread sizes V46, V69 and V92 and capable of processing materials up to 10mm. All kinds of zigzag operations in light to heavy weight Dacron, Kevlar, Webbing, Canvas and leather can reliably be realized with these machines. The basic mechanics (Rotary hook, adjustments and timing) is the same with Durkopp Adler 72525 and Minerva 72525, therefore it is easier for the sail lofts already worked with Adler 525 spinnakers machines. This sewing machine is recognized as the best spinnakers machine in the sail making industry. 9366-31HA Cam controlled extra heavy duty long arm zig-zag sail maker sewing machine: Long and High arm extra heavy weight zig-zag sail making machine designed for straight stitch, 1-step, 2-step and 3-step zigzag operations in the production of large-surface sails using very thick thread size V207 and needle 250. It easily sew 20mm thickness of Dacron, Kevlar, Webbing, Canvas and leather with its adjustable speed, pitch and zigzag action it can take on the largest sails you can imagine, described by the European sail makers as the Porsche of sewing machine, it is without doubt the strongest machine ever produced. The basic mechanics (Shuttle hook, adjustments and timing) is the same with Durkopp Adler 366-76-12 and Durkopp 266-1, therefore it is easier for the sail lofts already worked with these Durkopp Adler sail making machines. This robust and reliable sail sewing machine is designed for mass-production sail making business. 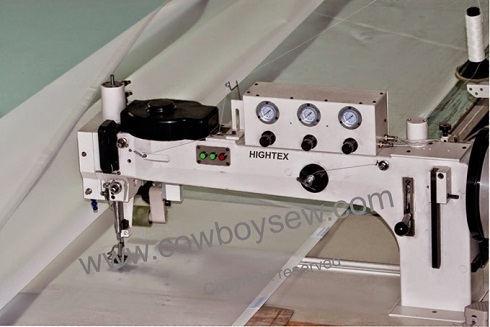 FM366evo: Extra high arm and long arm zigzag sewing machine for large sails -- Made in Italy: Super high (400mm) and long arm (760mm) heavy duty zigzag sail making machine. Today yachts and boats are getting bigger and bigger, many sail makers and repairs are ready to take on bigger projects and looking for a larger and high efficiency zigzag machine. We developed XL series sail maker sewing machines to meet your needs today as well as tomorrow. The heavy duty belt puller behind the pressure foot helps sail makers create a smooth, even stitch on large sails. The motor is also special, as it provides a large, even torque at any speed. This greatly improves the stitch quality when it is necessary to slow down, or change directions in large sails, or in the heavy patch areas.